Keystone is a warm and welcoming community. It appears that the mission of the staff is to ensure that all residents are comfortable, well cared for, and safe. The staff goes out of their way to know all residents and their family. A variety of activities and functions are held on a daily basis. It is comforting to know my parent is well cared for and happy at Keystone. My mom lived in the Assisted Living section of Keystone Commons for almost three years. She was very happy there. She got over the initial adjustment of leaving her home of 62 years quite quickly because of the friends she found at Keystone and the many activities she was able to participate in, and we are grateful that she lived her last few years in a loving and happy place. The staff and especially the friends she made were so supportive when she passed away that it just solidified that this was the right place for her to have lived when she could no longer live on her own. Keystone Commons has a lot of activities, and the food menu was great. The residents were very proud of their apartments, which were very nice. Half of the apartments had balconies and little porches on them, which was nice. They have a really nice setup for roommates where each roommate has a good-sized bedroom, a really large bathroom, and a closet, and the common space has a kitchen and dining. The living room also has an alcove sunroom which is small, but you can really have a lot of privacy, but you can still be together. It's a beautiful design rather than sharing a room. They have exercise rooms, and a lot of the activity spaces were scattered on different floors. The place is very large, and we were concerned about my mother comprehending it. It is 3 floors, and we thought it would be too much. But the person in charge of placement is probably the best we had anywhere, and she kept regular contact and they also send promotional gifts. I thought Keystone Commons was dark. It was right on a main street; there was nothing anywhere. You can't walk to a store or to a park or anything. If you want to walk someplace just to go out for coffee or something, you can't do it. It was nowhere; you'd be trapped. The rooms were a good size for one person. All of their showers were walk-in showers, and they actually had seats. The place was dreary and dark. It was on a long hallway kind of thing. It looked like they were saving on the lights because it was dark. I didn't like it. The dining area was small. It was at the end of a hallway, and it didn't seem well-lit to me. I didn't notice that it smelled or anything. I am sure that they are doing a wonderful job. It was for very much older people, too, and I was looking for something a little younger, but maybe for somebody who was 75 or 80 years old that would be all right. I went in at 5 or 6 o'clock in the evening, so maybe during the day it is a lot livelier. It seems that if I would be going back there with the family, I would have them look at it during the day. Thank you for your feedback. It sounds as if you visited during dinner time. While you may not be in the market for senior housing, you are more than welcome to visit with us again to discover the active community we are. We offer a comprehensive life enriching activity program, overseen by a full time activity director. Our full calendar of monthly activities also includes transportation to area shopping and recreational events. So give us a call or stop in and we'll provide you with an activity calendar. Then you can choose from one of our many daily activities according to your particular interests. We'd love to have you join us. There's a combination of reasons why we chose Keystone Commons for my father. I'm very impressed with the administrative staff as well as the direct care staff, the rating it received from the Internet search, the overall cleanliness, and the level of care that they're able to provide, in addition to its being a convenient location for my siblings and myself to maintain contact with my dad. In addition to the traditional assisted living, they have a secured memory care unit, which is something that my dad did need. Not all of the assisted living facilities have that or have placement available. They've been very good with my dad – on good days and bad days. Communication with family is never a problem, too. If we had more time to look around, there certainly are some facilities that are less expensive and newer, but this seemed the best choice at that time, and it's working well. Keystone Commons is a newer facility. It was only 5 minutes away from my dad's old house so he gets to see his neighbors and friends because it's so close. It was just a little more expensive. They're very, very clean, the entire facility was immaculate. The food was excellent, they're very heart healthy, conscious. Excellent facility and the people were very nice, very generous. I would recommend this facility as well. They offer a great deal. I liked the brightness of Keystone Commons and the availability of care and service. They were open about the amount of money it would cost and they were straightforward with what you got for your money. The staff was good, caring, thoughtful, and customer service focused. We've put a deposit for my mother so she can move into Keystone Commons. It has all the amenities that we were looking for at a good price. It has an Alzheimer's back-up facility in it, which seemed good. It's got well-sized rooms, people seem well cared for, and it seems to have all the features that one would expect in a well-run senior assisted living facility. Just outstanding care and attention given to my wife by all the staff. They are able to continually see to her needs during any/all physical and mental occurrences. I highly recommend their facility for their attention to detail! After moving mom into the memory care unit of Keystone Commons, we found Keystone Commons to be outstanding; making the decision to move a loved one from the family home is never easy. The staff has truly made this a positive experience. They have great skill in interacting and caring for mom. Their ability to get her involved in a variety of daily activities from baking to yoga has greatly improved her quality of daily living and alertness. Keystone Commons is a wonderful caring place. My mom is in memory unit and receives excellent care. The staff takes care of the residents as if it is their own family. It is difficult to make a decision to place your loved one in a new home away from their own, but Keystone made the transition a pleasant one and are very understanding as to what your going through and offer support. Everyone has been so nice from the office staff, care managers, nursing, dining, activities, maintenance, front desk and transportation services. The staff stays in direct contact with family to keep you notified of any issues and or changes whether it be medical or maintenance. I would highly recommend Keystone Commons for your loved one. Thank you for your kind words, we are so happy that your experience with us is so positive. The people at Keystone Commons in Ludlow are fantastic! They really care about the people and you can tell by the way the handle them. My uncle is 90 and is in their lock down unit and was one of their first patients. He is doing very well. If any issue arises, the staff is right there to calm down the situation. It's just amazing. The girl at the front desk is so polite and nice to me when I go in. Everyone is nice there. Keystone Commons is located in the town of Ludlow, Massachusetts. Ludlow is a small town with country flavor. The grounds consist of beautiful sculpted gardens, raised flower beds, and tables with umbrellas. Visitors are always welcome. There are no visiting hours and guest can stay overnight. “This is their home, not ours,” says Maryann. Guests are encouraged to share meals and participate in activities with their loved ones. There are many activities to keep busy and feel connected. Activities include pet therapy, musical entertainment, trips outside Keystone Commons, ice cream socials, bingo, cards, and various religious services. “It is truly the place you want your mom to be,” says Maryann. While visitors are welcome, security is still a top priority, especially in the memory care unit. If your loved one needs memory care, Keystone Commons offers top of the line professional care. Monitored 24 hours a day with highly trained staff, the unit is comprised of 12 studio apartments and is called The Cottage. In this secure unit, meals are served on site and there is a full time activity director. Activities are offered all day long and staff is trained by the Alzheimer’s Association to implement useful, proven tactics for the memory impaired. On site there is also a highly trained clinical neurophysiologist. “She is our go to gal,” says Maryanne. 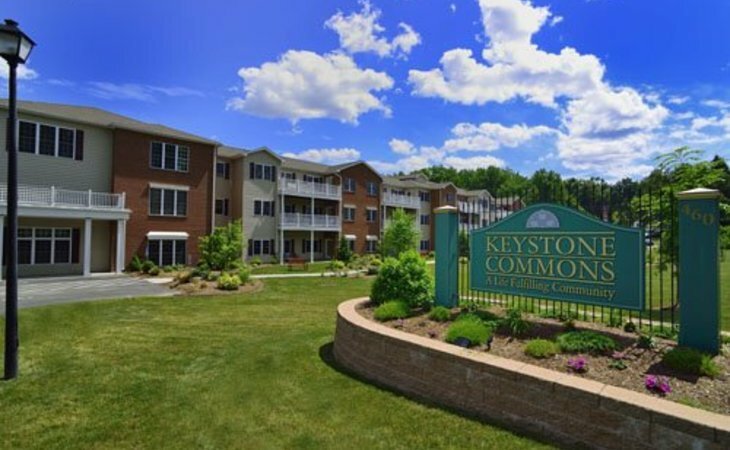 Keystone Commons has the small and intimate feeling of family with a variety of activities and services to make every person feel included and welcome. Your loved one can truly feel part of this big, tight-knit family that calls Keystone Commons their home. What should caregivers and potential residents know about Keystone Commons?